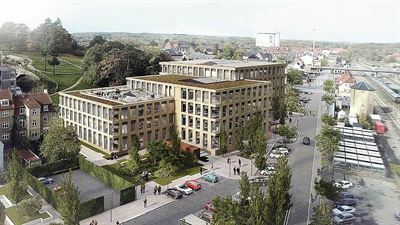 Caverion and Nordea Ejendomme have signed a Managed Services agreement for a new office building in Næstved, Denmark. The building will be built as a PPP (Public Private Partnership) and used by the Danish Immigration Service. The contract is worth over EUR 14 million and it is included in Caverion’s Q4/2018 order backlog. Caverion’s Managed Life Cycle concept includes life cycle operation, service and maintenance of the building throughout an agreement period of 20 years. This means that Caverion is responsible for the energy management, effectiveness, usability, safety, and condition of the property throughout its life cycle. Collaborators in the PPP project are A. Enggaard, Nordea, and Danish Building and Property Agency. “We look forward to yet another PPP project with Caverion. This is already the ninth project in the last few years in which A. Enggaard and Caverion are working together as a fixed collaboration. We consider Caverion's operations in life cycle maintenance as a significant contributing factor to the success of the collaboration,” says Anton Hessellund, Project Development Manager from A. Enggaard A/S. Caverion’s operation and maintenance work covers all technical systems and solutions in the property, including technical disciplines, such as Building Automation, Security & Safety, Cooling, Heating & Sanitation, Ventilation & Air Conditioning, and Electricity. The property is connected to Caverion’s remote management service, which on its part ensures agreed conditions and optimal energy use in the building. In addition to technical maintenance, Caverion is also responsible for managing soft services related to the property, such as canteen, cleaning and winter maintenance, through subcontracting. “This case consolidates our position in life cycle solutions in Denmark and supports our strategy of digitalisation and life cycle operations. The project is an illustration of our extensive competence,” says Michael Højgaard, Head of Division Denmark of Caverion. The total area of the property is approximately 10,000 m2. Caverion’s operation and maintenance starts in December 2019 and ends in the year 2039. Read more about our services to the public sector.